Receive your exclusive nine-piece luxury gift† valued from AUD190** when you spend AUD70 or more^ on Lancôme. Your Lancôme gift includes Color Fever Lipstick in 312 Rose 2.2g, Lancôme Star Bronzer 3.5g, Génifique Youth Activator 5ml, NEW Trésor In Love Eau de Parfum 5ml and the NEW Hypnôse Precious Cells Mascara 2ml. ABSOLUE ßx Day Cream 15ml, Night Cream 5ml, Eye Cream 5ml (not pictured). 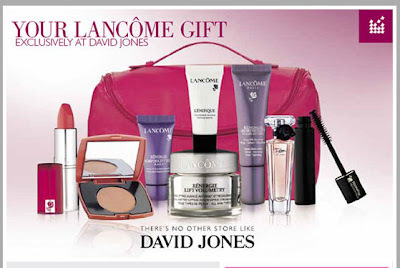 Each gift comes with an exclusive pink Lancôme bag. † Unless otherwise stated, bonus offers and gifts are limited to one per customer and available while stocks last. If the purchased item is returned, the bonus or gift must also be returned or its value will be deducted from the refund. **Valued by Lancôme. ^ In one transaction. Available while stocks last until 22/08/10. Lipstick and blush shades may vary. Not available in conjunction with any other offer. * Bonus Limited Edition Color Design trio lipstick only available at Elizabeth Street, Bourke Street Mall, QueensPlaza, Rundle Mall and Hay Street Mall.